Debuting at the Sundance Film Festival 2013, ‘Ain’t Them Bodies Saints’ seems to have little going for it apart from its rising stars, Casey Affleck and Rooney Mara. However, behind the façade, there is a lot to be said about this film directed by virtually unknown David Lowery, and it soon warms its way to the Grant Jury Prize nomination, winning the Special Jury Award, as well as forming part of the International Critics’ Week at the Cannes Film Festival 2013. 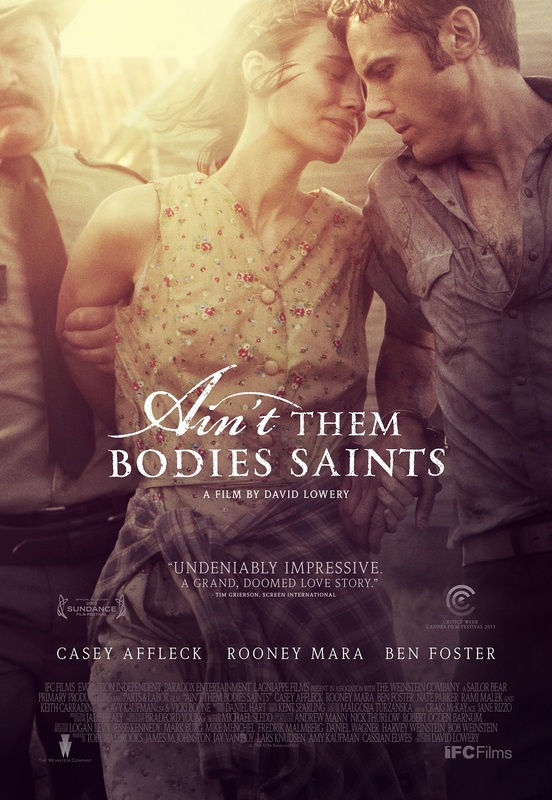 With an unusual title – ‘Ain’t Them Bodies Saints’, the film is set in rural Texas and tells the story of a young couple, Ruth Guthrie (Rooney Mara) and Bob Muldoon (Casey Affleck) who are engaged in a crime spree. When an altercation between the police and the couple results in Bob being sent to prison, Ruth vows to wait for him. However, his escape from custody sets people who care about Ruth and her daughter to do anything in their power to prevent the couple’s meeting, making Bob to choose between his love, promise and duty, and his family’s safety. The film’s theme is hardly original and almost too mundane, but the way it is presented is certainly not. It is remarkable how interesting this seemingly simple story is made. Nothing overly exciting is happening in the movie, but emotions are stirred, philosophical, existential depths are probed, and suspense, drama and romance are all combined and mixed to achieve one of the most stylish and subtlest of results. Rich in colour and sound, ‘Ain’t Them Bodies Saints’ transports its audience to the real rural Texas where gun-crime reigns high. The use of music is excellent throughout the movie, and it achieves unimaginable emotional depth, making every scene almost heart-breaking. The originality here is the use of hand-claps during some musical pieces played, which provides eerie, dark undertones, but also evokes these almost tribal, primal feelings and thoughts of the characters in suburb Texas. It is this brilliant use of music throughout the film which makes the most ordinary things and actions in ‘Ain’t Them Bodies Saint’ so full of significance. Linked to this is another enviable feature of the script – no character in this story appears truly evil/bad or truly good. Here, we see ordinary people. This adds to the feeling of realism and makes Ain’t Them Bodies Saints’ so strangely thought-provoking. Arguably, the audience can understand the position of every character in the movie. Starting from being hard-core outlaws, Ruth and Bob are then portrayed as ordinary people entangled in the circle of crime, but who, nevertheless, try to settle down and start a normal family – their true personalities and past actions are left to be judged by the audience. Bob friends’ personalities and their true agendas are also difficult to determine: although initially presumed loyal, they end up turning against Bob. Perhaps the ‘goodness’ in this story is emanating from the local (previously injured by Ruth) sheriff, Ben Foster (Patrick Wheeler), who befriends Ruth after her husband escapes prison. However, even here, the audience is left wondering at the original take on an already familiar story. Although initially appearing almost menacing, Foster shows feelings of affection towards a single mother, withholding his judgement on Bob; and Ruth, while initially over-protective, seems to respond and appreciate his affection. What is remarkable here is the portrayal of these reconciliatory actions between the police force on the one hand, and the criminal on the other. We rarely see this in today’s movies, that are primarily focused on building and accentuating the contrast between the two forces. Coming from the director known for directing only short films, this first big picture is an impressive achievement. Here, one instantly draws parallel with Terrence Malick’s major films, such as ‘Badlands’ (1973). However, unlike some of Malick’s films, e.g. ‘Days of Heaven’ (1978) and ‘To the Wonder’ (2012), ‘Ain’t Them Bodies Saint’ has this feeling of suspense and thrill, and it is the lack of these that makes ‘To the Wonder’ and ‘Days of Heaven’ appear endlessly dragging. And it is not just the subject matter, i.e., crime in Texas, which makes this film so suspenseful and thrilling to watch. The use of music, beautiful camera-work (those Malick-inspired sunsets) and the sheer richness of sounds (from heavy breathings to rapid footsteps) makes the picture strangely poetic and aesthetic, successfully combining suspense with philosophical undertones. Although Lowery may lack Malick’s grand vision and design, he excels in making western/crime drama romantic and poetic. The fact that one even draws parallel with Malick upon watching ‘Ain’t Them Bodies Saints’ should tell us that Lowery has a promising future ahead of him, and we may expect many high quality, interesting films to come from him in future. ‘Ain’t Them Bodies Saints’ would probably not be so great but for the outstanding acting. Both Mara and Affleck are very convincing in their respective roles, and it is pleasing to see two leads who complement each other so well: Mara and Affleck look good together, and have a good chemistry on set, making their attraction in the film very believable. The turbulent love/hate relationship between their characters is made clear from the very first scenes, making it also evident that they too share any ordinary couple’s ups and downs, and insecurities in a relationship. The opening sequence is actually what immediately wins one over or confuses and disappoints. On a negative side, the script faults at times, and one can even criticise it for character underdevelopment. For example, the drama is somehow lessened by Casey Affleck’s character, Bob Muldoon, and the circumstances surrounding his actions. The film would have appeared more dramatic if the audience were to feel greater sympathy for the character and really feel the injustice surrounding his run. The assumed “injustice” surrounding Bob Muldoon’s run from the law expresses itself in two ways: Bob took the guilt for wounding the police officer on himself, shielding his pregnant wife (hence te long prison sentence), and his ‘friends’ betrayed him by setting a hunt on him. However, these are not very effective in producing feelings of a truly extreme injustice committed so that the audience can feel real pity and compassion for the character. The success of the film’s final scenes relies heavily on the audience feeling affection/pity for Bob and Ruth’s lost happiness, and more should have been done to bring this about. High praise indeed. I can’t wait to see this one now. Great review! Good review. This one really worked for me, because it felt like there was more of a story to it than just pretty visuals and sounds. There was actual emotion involved with this here, and made me care for these characters all the more as it moved on along.